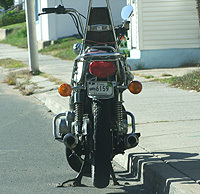 Similar to Early American passenger car plates, these are used on motorcycles which are at least 20 years old. This type started in the mid- to late- 1990s. With the general-reissue in 2000, the design was changed slightly to what is seen below. As of April 1, 2014, “Classic Motorcycle” plates are issued in place of the E.A. Motorcycle type. Unlike the “Classic Vehicle” type for autos, these plates still feature a graphic.